There’s a journey of discovery in the making of all paintings. Artists physically travel, or mine their imaginations, unearth new inspirations, or explore new techniques. Here, we have two artists who sometimes find their ideas in similar ways yet, their creativity takes them on separate paths. Dawn Stacey’s dreamlike landscapes are painted in acrylic, allowing her to work quickly, building layer after layer of detail and colour. The paintings are usually based on still life or the landscape in its different seasons, evolved from walks or travels. “My imagery is a combination of gathered objects, memories or an atmosphere of a particular place. The final painting is intended to capture the essence or mood of the subject.” Intricate and balanced, they resemble a collage or a tapestry. Meanwhile, Ellen Watson describes her process as “a form of travel whereby stuff is revealed and inadvertently uncovered, so in a way a picture is found rather than made”. 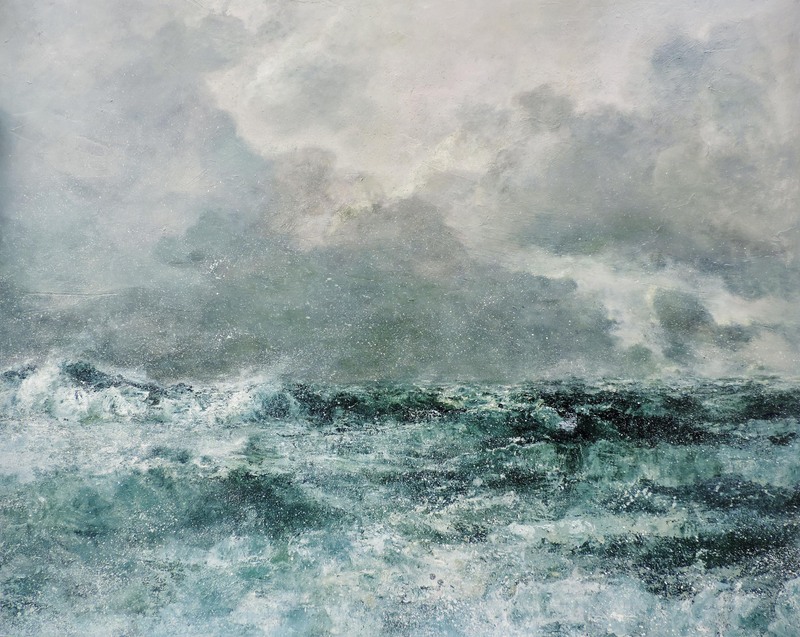 She taps the elemental forces of the rugged Cornish coastline for inspiration, painting untamed seascapes and weathered coastal views, focusing on the strength of light and ‘that point of contact between the sky and the horizon’. Literature often plays its part. Patrick O’Brian’s HMS Surprise has been the influence for many of this exhibition’s paintings. Watson strives for the painting to be more than just a view, and aims to immerse the viewer within the vastness of the subject matter and the visceral presence of the painting itself.